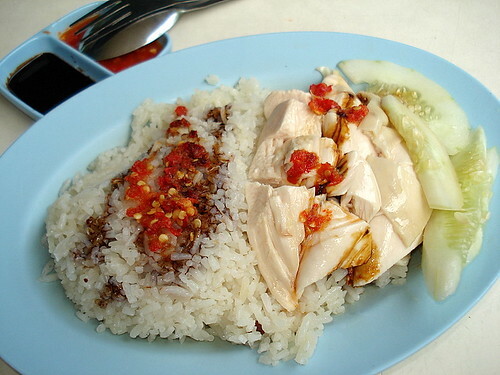 Sin Kee Chicken Rice, originally uploaded by Camemberu. There are quite a few stalls selling chicken rice at Margaret Drive Food Centre (some folks know it better as Queenstown Centre). Sin Kee is an old favourite (selling mainly white steamed chicken) and you will see that it accounts for most of the business on the second floor. I am sure I must have tried it in the past and not remembered it. Today I am refreshing my memory tastebuds. My S$3 plate arrived with plump, juicy, tender chicken - it's amazing that they even got breast meat to that consistency! However, the soy-sesame seasoning they drizzled on the chicken didn't taste like much (maybe I should have gotten my plate of chicken separate from the rice and asked for more sauce). The rice itself although well-steamed was also lacking in flavour, making me yearn for Yet Con's version. Well, top marks for Sin Kee's chicken texture but I think I'll try Tong Kee next time - it's on the first floor with roast chicken and roast pork that looks scrumptiously tempting. Queenstown Poh Pia Springrolls, originally uploaded by Camemberu. 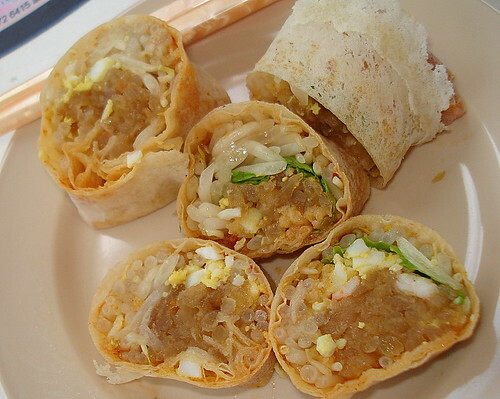 After the chicken meal, I headed downstairs for my dose of vegetables - hehe, in the form of popiah (I love springrolls!). I had also heard this stall was good. But it tasted really average today. Not enough of the crispy stuff. Not enough sweet umami flavour. The skin was also slightly papery and dry (I know they make their own but this is still not my type, sorry). I'm glad to say the Marine Parade central food centre's Homemade Springroll trumps this any day! #01-27 — at Yuhua Village Market & Food Centre Blk 254. Hi Liverpool! The sui jiao - do you mean the Shanghainese dumplings? I think they are diagonally across or opposite from Sin Kee (i.e. the other end of the block and facing other side). Yes, they are still in business! :D Not much else was open on the second floor though. You use sesami seeds for cooking? In Japan and South Korea, sesami seeds are popular to be added to any kind of dishes but I didn't see it in Bangkok and Philippines. Hello again, Taro! Yes, we use sesame (goma) a lot here in South East Asian cooking, especially the Chinese. I'm surprised you didn't see it in Bangkok. Thais use sesame too. guess its no longer there...just next to the chicken rice stall.. Sorry, Liverpool, didn't see any shops open next to Sin Kee. But hey, maybe it's their day off. Hopefully. Cafe Divine: Spaghetti with Wok Hei? OMG! You *HAVE TO* listen to this! Hill Street Char Kway Teow - Still the Best! Char Siew Bau: Malaysia Boleh! Paradise on Earth: Good Value Steamboat!